Speaking to a crowd of 300 people, Erton Köhler, President of the Seventh-day Adventist Church in South America, praised the mission of Maranatha Volunteers International at a missions event in São Paulo, Brazil. Köhler was the keynote speaker at “Missão: Maranatha,” a special program, organized by Maranatha, to celebrate missions and service. The event, held at the Morumbi Adventist Church, highlighted Maranatha volunteer testimonies and several Adventist Church leaders, including the presidents of the Adventist Church in Bolivia and São Tomé and Príncipe. It also featured the music of Jeferson Pillar, an Adventist musician. “It was simply fantastic. Mission is waiting for us!” said Thamires Ueislla, who attended the program. 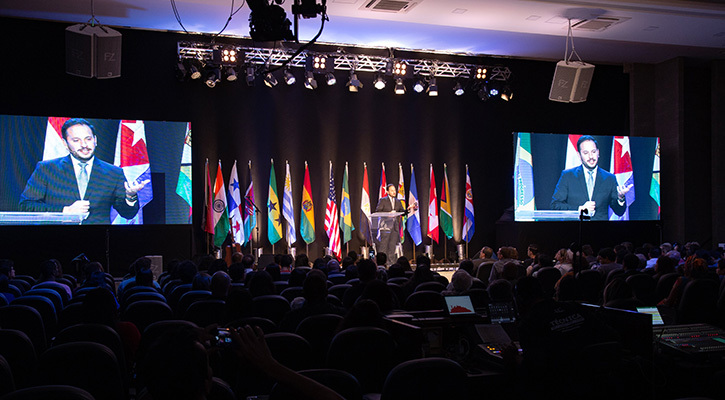 Maranatha has held a similar program in North America for decades, and this is the first time Maranatha has coordinated a convention outside of North America. Called the “Maranatha Convention” or “Mission: Maranatha!”, the event highlights the organization’s current work. Volunteers share stories of their experience in the mission field and the impact service has on both their lives and the local community. Adventist Church leaders share the need for churches, schools, and water wells. In 2015, Maranatha established an office in Brazil to develop a volunteer program in the country. That year, Maranatha also launched a Portuguese-language version of Maranatha Mission Stories, a television program about Maranatha’s mission. Maranatha Histórias de Missão debuted in April, and the first team of Brazilian volunteers headed to Angola in September. Since then, Maranatha Brazil has mobilized 15 Brazilian teams to countries around the world. Maranatha has worked in Brazil numerous times throughout the organization’s history. However, Maranatha kicked off a major effort in 2010 to construct churches and schools. Through collaboration with the local Adventist leadership, Maranatha has completed more than 950 projects in Brazil. An edited version of “Missão: Maranatha” will air on Novo Tempo, the Portuguese-language affiliate of the Seventh-day Adventist Church’s official television network, on July 8, 17:00 U.T.C.